Who has family or friends that are not particularly fond of your homeschool decision? Who has run into total strangers that feel like they can comment on your decision to homeschool? I’m betting that you’ve had your fair share of homeschool nay-sayers. I have certainly run into people who disagree with our family’s choice to homeschool, and they enjoy telling me why homeschooling doesn’t work or why this decision was all wrong for my family. 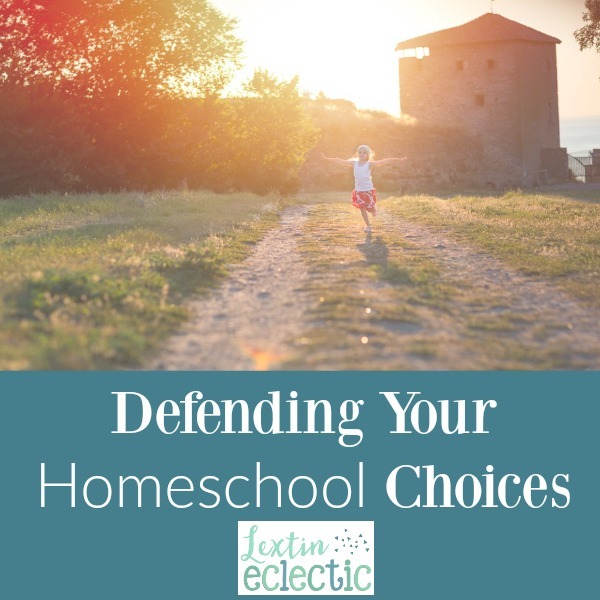 However, it’s most hurtful when you feel like you need to defend yourself to other homeschoolers who are judging you for your particular style of homeschooling or for some of your curriculum choices. I recently filmed a time lapse of our homeschool day. It was actually my husband’s idea because he’s always wanted to be a fly on the wall during a typical homeschool day to see what it really looks like. Ok, maybe he just wonders why I’m so tired by the time he gets home. He set up a camera in the corner of our room and as soon as I walked into our homeschool room the next morning I turned it on. For the entire morning it filmed all of the activity and chaos in our homeschool room. That night we sat around the computer and laughed about the craziness of our homeschool day. The kids loved watching all of us scurry around in fast motion as we completed a typical homeschool morning. For fun, I decided to share my video on social media. Then the video was shared by other bloggers and by vendors in the homeschool community. After just a few weeks, I was seeing the time lapse of our day everywhere! I was so excited! Then I started to read some of the comments, and at that point I became discouraged. There were negative comments about how early we start in the morning – about how they would NEVER do that in their homeschool. People commented that my children do too much sitting. Some said that we spent too much time in our homeschool room. Others were almost offended that we even have a homeschool room. A few said our day was no different than public school and bashed my homeschool style. Should I worry about their comments? No. Do these people even know me or know anything about my little homeschool? No. But guess what? Those comments stung. They hurt. I was so sad that other homeschool moms were trying to find anything and everything they felt was wrong with my homeschool day. So, I’m going to share my time lapse right here and then I’m going to provide a short defense. Yes my day starts at 6. What you don’t know is that my husband leaves for work at 6. My day starts at 6 because while my husband leaves for work very early, he also comes home from work early. I want to be done with our day and be able to spend our afternoons and evenings with him. Also, I found that my older children need some quiet learning time that is not interrupted by toddlers. The only time this will happen is before the little people wake up in the morning. We enjoy our quiet and snuggly morning time. My kids are most alert in the early morning and their brains are ready to learn. Do my children sit around all day? In case you can’t truly see the video, my kids are up and down all morning. However, I do sometimes expect them to sit for 30 minutes at a time. Oh the horror! Occasionally I do want them to sit with me and listen for short spans of time. I think that sitting and listening is a skill that needs to be learned. And I don’t think my expectations are unreasonable at all for their ages. I actually rotate working with my children so they can take turns playing. What the camera doesn’t show is that some of my kids are outside walking the dog. Others are in the family room lying on the floor playing a game together. The camera doesn’t show the giant bounce house that is in the room down the hall. Yes, there is a bouncy castle in our playroom. You can’t hear the kids giggling as they bounce for hours at a time. And do we spend too much time in our homeschool room? My kids certainly don’t think so. We love our spacious, bright, and cheery room that is filled with books, art supplies, and a giant table to learning together. It’s our special space to learn and explore, to make messes, to laugh together, and to snuggle and read. I’m not going to apologize for having a homeschool room. Having a separate space for our homeschool time has been very beneficial for our family. I feel blessed and grateful that we have a spare room for our table and bookshelves. Our homeschool functions best when we have a place for focused learning. It’s a place where we can work on projects or have books strewn across the floor and I don’t worry about the mess. My homeschool style is somewhat structured. I have 6 kids and I struggle with clutter and spontaneity. I function best when I have a familiar routine. My kids seem to do best this way as well. Yes, my homeschool day has a structured daily routine. However, this alone doesn’t make my homeschool closely resemble a public school. My kids get individualized instruction time with me. We have group learning time where they can benefit from learning with older siblings. My kids read together and we have hours of read aloud time. They are also able to move around while we do school or do hands-on activities while I read. Our school time is fairly active and it can be pretty loud. I’m not sure if you’ve been inside a public school classroom lately, but I can tell you that overall, my homeschool doesn’t look like a public school day. My homeschool is purely a reflection of my family and the needs of my children. It was designed with them in mind. This time lapse shows only a tiny glimpse into our homeschool. It focuses on only one room of my house. It shows only our homeschool morning. You’re not seeing the bigger picture – the field trips we take on Friday, the evenings when my kids go to swim team, the bounce house in the next room, or the time spent outdoors at the park, in the creek, or hiking in the woods. So, can we agree as the homeschool community to stop attacking one another for our differences? Can we learn to accept that our homeschool won’t be like anyone else’s homeschool? While it’s very hurtful and discouraging to have to defend our homeschool choices to family and friends who may not truly understand what homeschooling actually looks like, it’s even more hurtful to be bombarded with negative opinions from inside the homeschool community. When will we realize that the true beauty of homeschooling is embracing homeschool differences and celebrating the freedom to make our homeschools a creative expression of our unique families? For this reason we don’t need to defend our homeschool choices to others. We don’t owe anyone an explanation or an apology. What a wonderful post and SO very true! Seriously? People criticized you for that video? That’s nuts! You are super woman, in my book! I love the kids popping in and out—in pajamas, the mix of one-on-one with group learning, the entire setup of your room. Some people are just mean and critical. Thanks! Yes, the video was posted on some FB pages and there were some people who were really negative about it. It’s frustrating! I have always said that homeschooling is about freedom and choices and how I homeschool simply reflects what works best for my family. It was discouraging to have something that was supposed to be fun turned into more of a debate about the “right” way to homeschool. Sigh! Sometimes homeschool moms aren’t very nice.